English academic vocabulary is used not just in university courses, but in newspapers, professional journals, meetings, and conversations-- and in business negotiations and operations throughout the English-speaking world. It’s important to understand if you want to deal with any educated English-speakers beyond a survival-level conversation, and it's essential for professionals with international contacts. 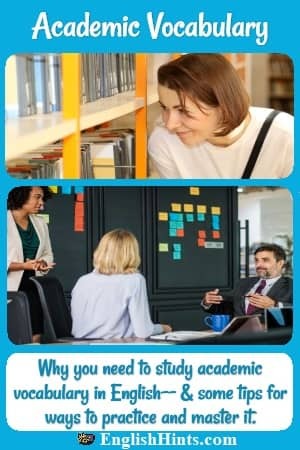 Studies have shown that learning just the 570 words of the Academic Word List (along with knowing the 2,000 or so most frequently used English words) will enable you to read almost 95% of ordinary or academic English writing. It is possible-- but not recommended-- to learn the words you don’t know on the lists by memorizing them and their definitions. You will remember them much better if you learn them in context, by reading real texts that use those words to make their points. You will also get a better understanding of the various exact meanings each word may have. If you have studied English enough to understand this page, you likely know much of that vocabulary already. It’s worth taking the time to systematically study the words you don’t recognize, so that you can participate in international business and professional conversations and keep informed about your field. Studies show most people need to read or hear a word multiple times (at least 6-10 times according to the sources I have read) to really learn it, so some kind of reading and practice plan can help you learn the words you don’t yet know. That’s why I started the English Detective newsletter. Each issue provided readings and practice with about 20-30 words of the Academic Word List (or AWL.) In just under a year, it has now offered explanations, readings, and practice for the complete AWL (for most words 5-7 times or more). You can study those issues here. English Detective will continue to offer great readings and practice activities to improve your English vocabulary and comprehension as well as to review the AWL. Sign-up for it in the form on the left. There are several other ways to study and practice the AWL. See 3 Ways to Learn the Academic Word List for EnglishHints page recommendations, as well as some other sites and some excellent books. Whether or not you are ready for a project to learn new academic vocabulary every week, you may want to look at some strategies for learning English vocabulary effectively here. If you want to practice specific words on the AWL, you can also check the Alphabetical Academic Word List Vocabulary. There are hundreds of thousands of words in an unabridged English dictionary, and most educated native English speakers can understand thousands of words, but the great majority of English writing and speech is composed of just a few thousand words. The General Service List (about 2,000 words) and the Academic Word List were made by examining a very large number of English texts and choosing the words that appear the most frequently. Isn’t it worth the effort to learn basic academic vocabulary? Those 570 words give you access to so much! Wondering where to start? Besides trying English Detective, (or looking through the Alphabetical Academic Word List Vocabulary pages above), you could try a few practice pages to get an idea how much AWL vocabulary you already know-- maybe more than you think! Try Vocabulary for Social Change, Science Vocabulary, the Adjective Opposites Matching Games, or Vocabulary for Achievement for starters. 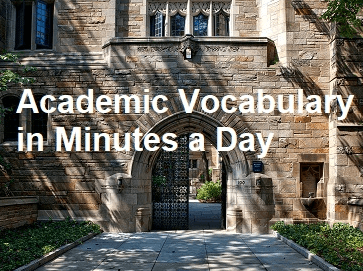 Almost all of the vocabulary practice in Vocabulary Games (and most from TOEFL & IELTS Vocabulary after the Daily Life Topics section) is from the Academic Word List, too. 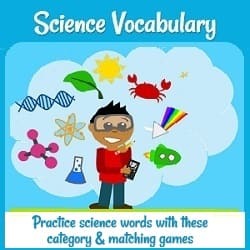 If you enjoy matching exercises, gap-fills, crosswords, category games like Odd One Out, or even multiple choice questions, you can find vocabulary to practice on a variety of topics there. Use vocabulary strategies like context clues, word parts, cognates, mental pictures, rhymes, and grouping related words to help you keep learning new English words. 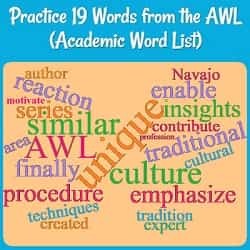 Practice test-taking skills and AWL vocabulary on culture, tradition, and more from an article about Navajo detectives. Do you need a lot of English vocabulary to prepare for the TOEFL exam or for university study? This course can help you learn essential academic vocabulary & skills step by step, in just a few minutes each day. 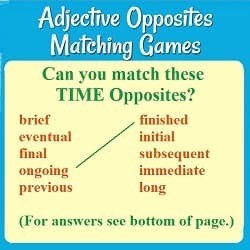 Have fun while practicing these important academic adjectives with this & related opposites matching games. (There's also a short essay on game programming so you can see these words used, in case some are unfamiliar. Try playing it now!